Casual Outfits for Kids. Now that winters are here, mummies need to gear up their kids for the cold season but why compromise on the style, right? Well, time to update your little ones wardrobes with these warm and fashionable attires. 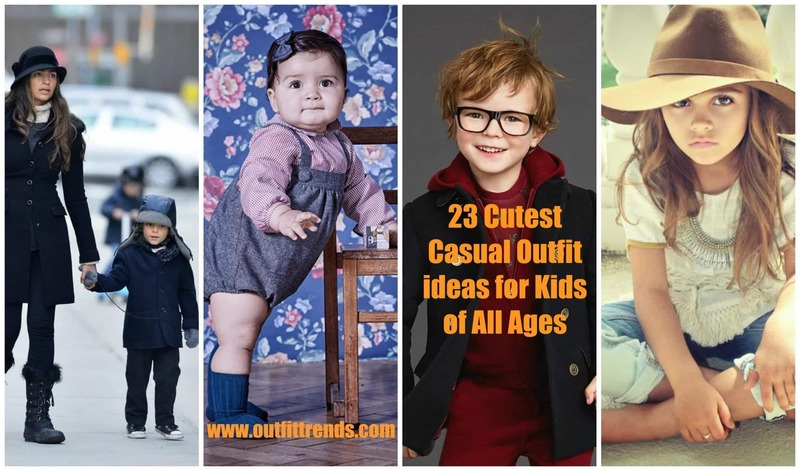 We have compiled for you a list of 23 smart ways to dress-up your children this winter, have a look and let us know which one, of the following suggestions, is your favorite. Denim can never go out of fashion. Not only are these easily available everywhere but the fabric is adaptive to be used roughly. 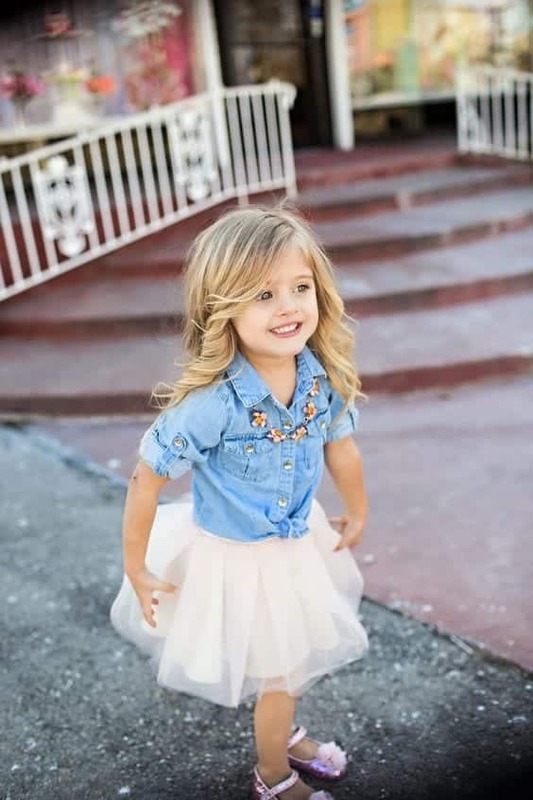 Dress up your little princess in the easy-to-carry denim shirt with rolled up sleeves, pairing it up with pastel colored tutu or net skirt to complete the look. Brown leather boots or pastel colored leggings with this style will add a cherry on the top. It doesn’t snow every day even in winters, so when the sun shines bright, adorn your little girl in the beautiful cream colored cotton shirt with pretty laces sewed on it, pairing it up with cowgirl hat and ripped jeans to complete the look of the boho-chic style. A couple of beaded bracelets would look lovely with this style. Pullover with a hoodie is in style since forever, no matter how sophisticated the child is hoodie will make them have that cool look along with keeping them warm from head to toe. Pull it off with contrasting inner and moccasins for a modern chic look for your smart boy. If your little boy is always up for little adventures but doesn’t like to me bundled up in multiple layered suiting then go for these lovely hand knitted sweaters by Next. These cosy sweaters will keep them warm up while they can enjoy their time playing with their buddies. Check looks smart no matter how you wear it, so why not go for this festive dress for your tiny tot. This beautiful check sweater, paired up with the bright red jingle bell leggings, brings out the festive mood of the season. To complete the look you can add a straw hat with 2 bells tied to it. Well, for children comfort comes before style, but when you can have both, just grab it with both hands. This festive season, cosy up your children in these super soft warm pajamas and hoodie that are too cute to be missed. Your child will surely enjoy this winters with these super comfy dress. #16- Baby Girls Casual Outdoor Clothing. Make your kid look dapper in khaki pantaloons and navy blue blazers. This gentleman style is fashionable yet it keeps the winter chills at the bay. Complete the look with comfortable canvas shoes so that your kid can play around easily. Want to dressup your doll to save her from the harsh weather without compromising on her style? Then opt for this adorable attire. This beautiful hand knitted Aline frock with intricate embroidery can be worn with a turtleneck of dark hues along with a leggings of similar color to keep your baby warm at the same time maintaining the classic vintage look of the dress. Not every kid is comfortable with old styles. Some of them love following the current trends and if your little princess is one of those, dress her up in this hipster jeans and lace shirt. The hand knitted upper and these glittery, glamorous boots will surely make your girl the diva of her group. Some vintage styles are too classy to quit. One such style is of wearing chinos with gallace belt and round neck check shirts. This winter bring the vintage cuteness in your kid by dressing him up as a gentleman of 80’s. Don’t forget to make him wear the boots too, to keep his feet warm. Winters can be drastic for children so what can be better than the old-styled dungarees with full-sleeved shirt or a cosy cotton turtle-neck. Make sure you cover your baby’s head in a warm woolen bonnet and her feet in woolen socks, you don’t want them to catch cold, now do you! Let your precious boy enjoy the winters in the bomber jacket and faded denim. Keep his ears and feet warm with beanie cap and woolen socks. Don’t miss the joggers, you want him to enjoy the outdoors to the fullest. #8- Dressing-up for a Concert. Bring out the pop diva in your child by dressing her up in a cool corduroy pants, heavy boots and a denim jacket. If you live in colder region, don’t forget to tie-up a muffler scarf around her neck. If you reside in a severely cold climate then you need to be very cautious when making winter clothing choice for your kids. In order to keep them warm enough to let them have the best time, bundle them up in warm hoodie with peacoat. To pull off the handsome look, pair up the coat with contrasting color straight-pant. #6- Christmas Party Dress for Girls. Overalls can never go wrong. One doesn’t have to worry about the seasons or weather when it comes to dressing up your child in overall. Just because it is fall, it will be great if you can get your hands on woolen overalls with hoods stitched with them. Overall provides the comfort your kid needs to roam around freely as these are normally made of stretchy materials. So grab one now and put it on on your adorable gem:). With floral prints being all the rage now a days, dress up your cutie pies in these vibrant,brightly majolica prints by Dolce and Gabbana. The prints are inspired from the tile prints of Italian Renaissance period .You can either pair a printed shirt with casual everyday pants or tights or buy a printed skirt to go with the shirt. A casual straight printed frock will definitely be a fresh addition to your doll’s wardrobe. Young boys love collecting badges and showing them off to friends. This year Kenzo Kids has introduced a badged sweatshirt for young boys that does not only look super cool but it keeps your naughty kid warm too. Pull it off with a muffler and heavy leather shoes. Kids these days are more fashion conscious than the adults and if your little princess adore fashion, then dress her up in the super charming swingcoat and riding boots. The style is classy and it is easier to carry in winters. Tie her hair in high ponytail and she is all ready to walk the ramp. #1- Fall Funky Fashion for Kids. Winters are normally gloomy and dull, so why not bring a little joy in it by dressing up your lovelies in brightly colored padded jackets, geometric-printed trousers and vibrant colored Tees. This comfortable style is casual yet funky and will help your kids face the chills with full preparations.